I’ve been organizing an event with Markus Renvall. It’s Media Art UP! A new type of an exhibition and an event for new media art. Here is the press release (PDF). I coded the web page & made the graphics. The venue of the event is the Cable Factory in Helsinki, Finland. I made a few new pieces to exhibit there. The “Mood” was a very tough one to conceive especially! The disputing heads are screens, playing ID Software’s Doom game! A brightly lit photo below. The exhibition lighting setup is more a favourable one. Chicken On Steroids *edit: WINNERS ANNOUNCED! I had this idea a few years back, when I heard that growth hormones are used in the U.S poultry industry. When I saw the Finnish “From Bits to Atoms” call for entries, I decided to enter the competition with this entertaining “Professional Fitness” character. The competition called digital artists to send their work to be machined / printed in physical format. This statue called for classical influences, but with a contemporary popular culture twist. 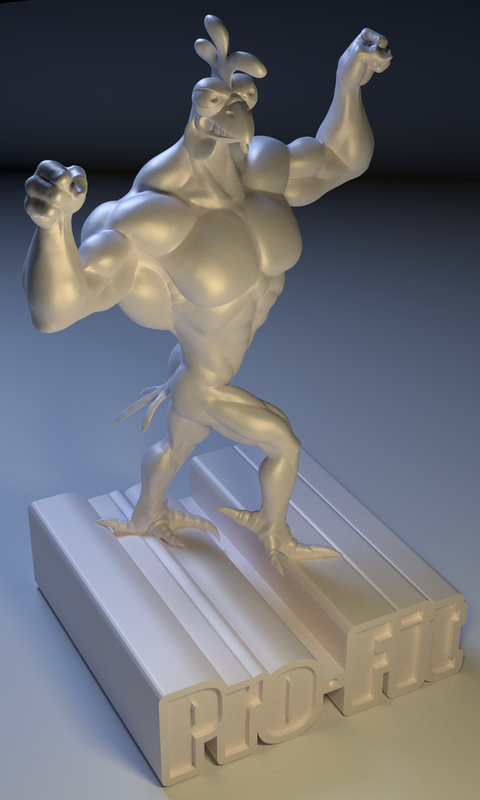 I did most of the work in Sculptris. Text was made with Inkscape, and extruded to the 3rd dimension in Blender. Text was also combined with the posed character in Blender. Blender cycles is really awesome! 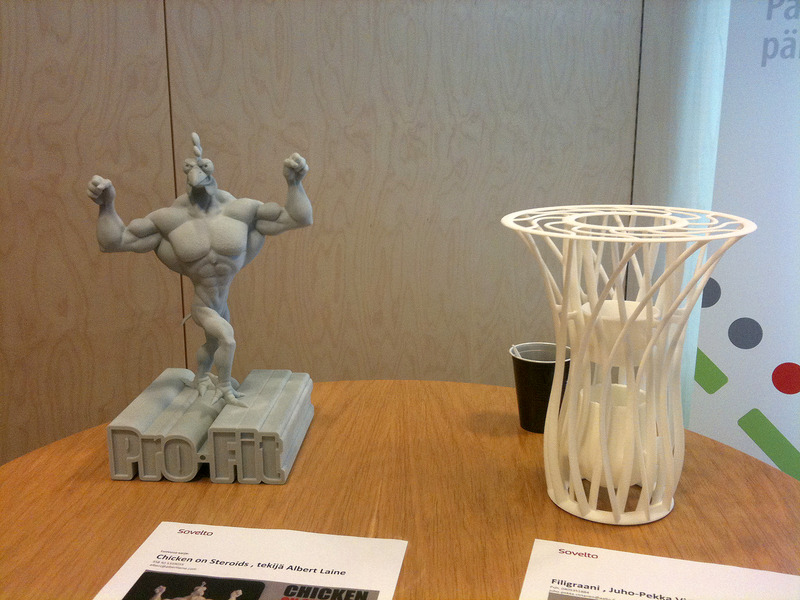 The statue was then prepared for 3D printing / CNC machining in Netfabb Studio Basic. This chick is massive! Check out her delts and traps! Today (19th of April 2012) was the day when the winners of “From Bits to Atoms” -rapid prototyping contest were revealed! …And not in that specific order. 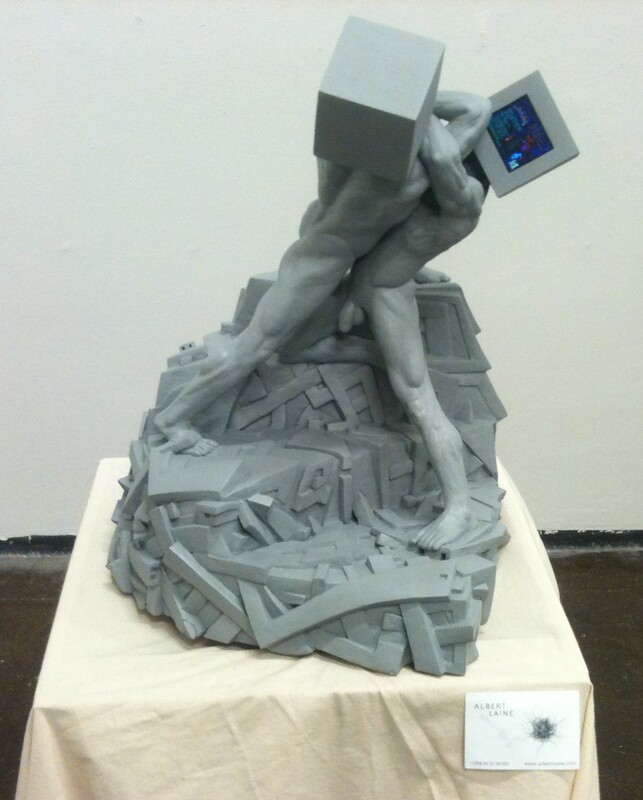 The figurative sculpture is the Runner-Up, and the design vase won. ..Sorry about the coffee mug behind the winner, and the bad quality photo. I’ll take & post better ones later. Industrial design was valued high by Jukka Tuomi, who picked the winners of both categories; the “creative, aesthetic & entertaining” -category & the “inventive, usability” -category. I’m happy for the experience, and the ability to test the detail limits of the current 3D printing technology (I made this beast detailed enough to be printed in life-size!). Getting my sculpture Rapid Prototyped for free (a service worth 600-700 Euro) was nice too 😉 I do think the result looks great! People passing by seemed to like spending time gazing my sculpture as well. 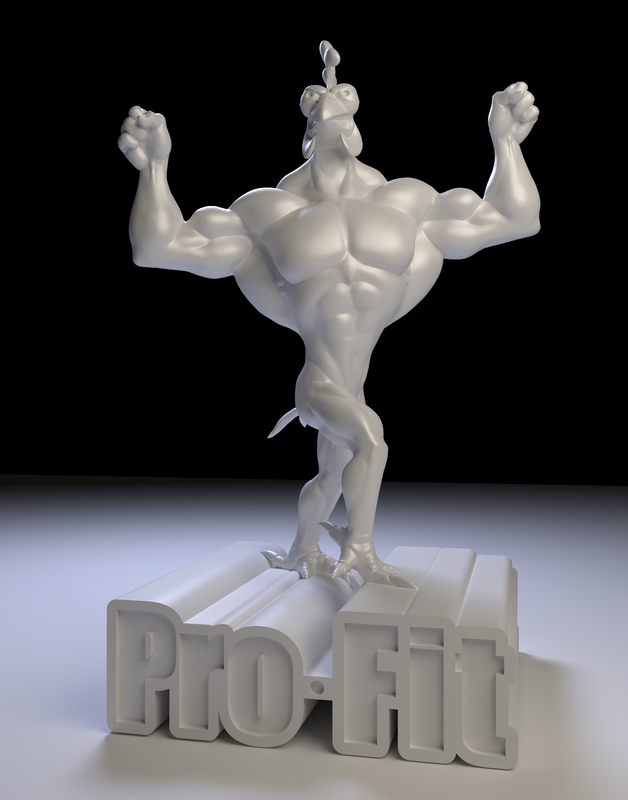 I’ll exhibit my “Chicken On Steroids” sculpture in a gallery & art museum context later, so stay tuned! Chic Art Fair Paris and PvonK Berlin have been working in collaboration to organize a URBAN SCREENING on an outside concrete wall, longing the River Seine in Paris. 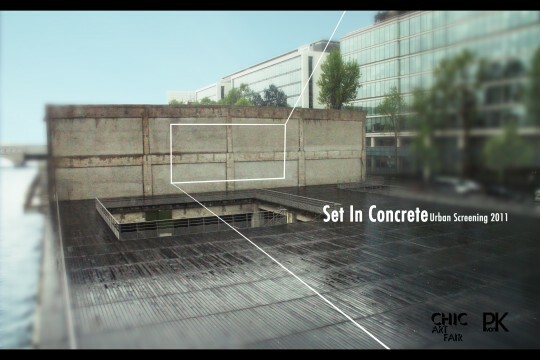 The Screening “SET IN CONCRETE” will take place every evening during the Chic Art Fair: OCTOBER, 20th-24th 2011. Among the works shown, will be FocusPocus-videoparadox. For a complete list of participating artists have a look here. BTW, it’s the first time my work has been exhibited with Damien Hirst, Banksy & Shepard Fairy (to name a few). 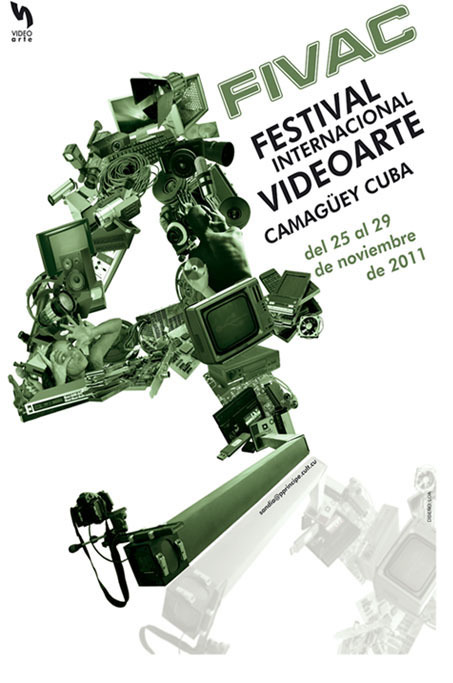 Our installation is selected in the 4th International Festival of Video Art, Camagüey 2011, Cuba. It seems to have an effect in many cultures. Maybe because (whilst doing it) I ended up dealing with the general questions of humanity that are common to us all, regarldess of culture and political country. It’s time to post some art done in “old school” medium; The Graphite pencil. Between 1997 – 1999 in my teens, I spent a considerable amount of time doing small psychological portraits. I had a perfectionist obsession with an 0.3 mm mechanical pencil with HB softness leads. That was before I learned the digital medium. Even before I learned to illustrate with an airbrush. I did some pretty amazing stuff with my trusty old 0.3 mm back then 😉 It was the tool of my choice! Usually i took a sheet of A4 photocopy paper, with a fine grain (to give the HB leads a little something to bite in to). With such a fine tip, I developed a technique to lighten the strokes to a minimum. I lifted the paper off the table to apply the lightest pencil strokes possible. I did not use an eraser or smudge the paper with anything. I wanted it to be clean. To me, Cleanliness was next to Godliness! As I was zoning out and shading an area, pass by pass darkening it, impurities such as a dust speckle, or the grain of the paper caused slightly darker details. I took these “errors” as sort of hints, and started to plot what they represented to me. 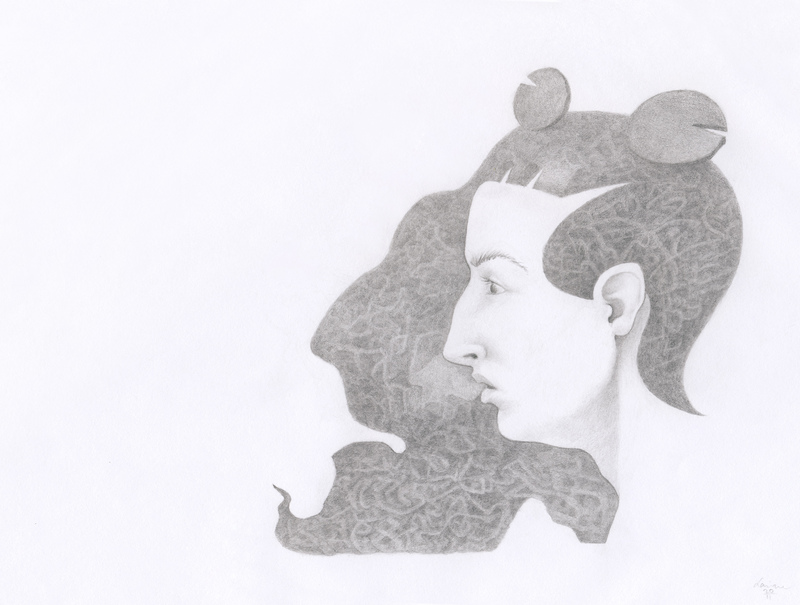 I started to see shapes of immense detail… I managed to tap in to my creative subconsciousness. I started to refine those details and instinctively rotated the pen between my fingers to find the sharpest edge of the 0.3 mm tip. That way I could reach dents in the paper grain, and make areas darker, where need to be. 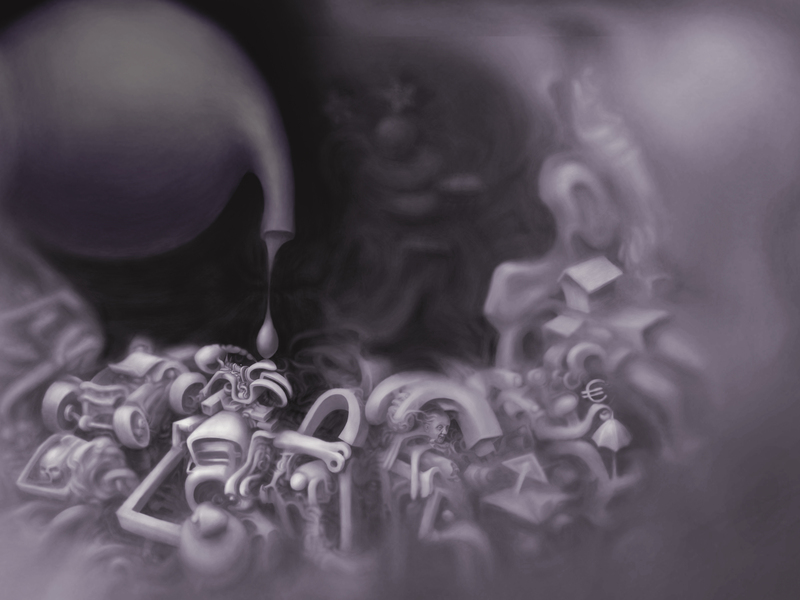 As I continued finishing the piece, the complex shapes started to connect, creating dynamics and content. It seemed that the grain of the paper continued the shapes to an immense level of detail. Some people (with sharp eyesight) have experienced that mesmerizing effect. I did this piece yesterday, with the very same exact 0.3 mm mechanical pencil 🙂 I’m happy I still have the precision, patience and light touch to create with this challenging style! Spending some 15 hours with an area of 115 mm x 125 mm may sound crazy to some, but hey, Art is! I’ts quite beautiful original IRL (In Real Life). One might say that the face is realistic, and the “hair” is abstract, even tough I see it the other way around. I see the face as simplified to very few contours of flowing shape, and the shading in the face is a subtle hint to it’s form. To me, the hair is the “tangible” part 😀 It took most of my time creating it. 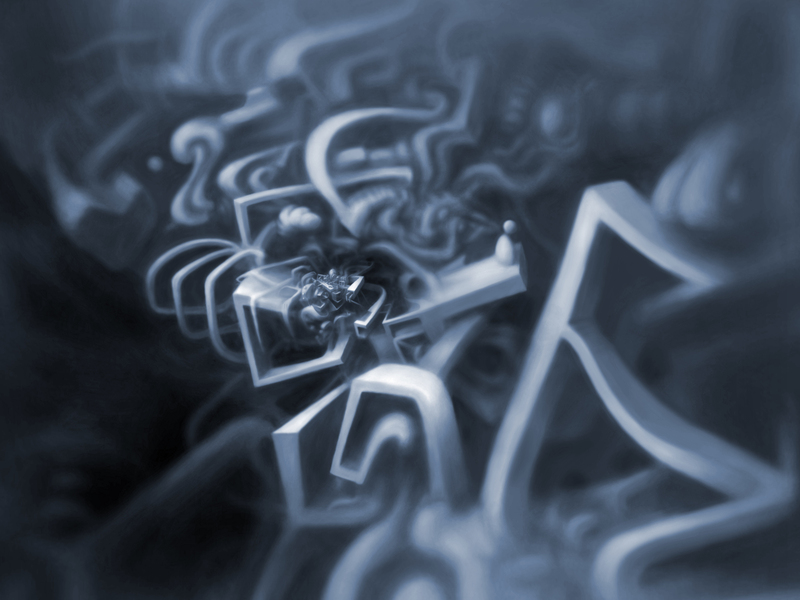 Maybe someone would like to plot the hidden message in the graffiti style lettering from the abstraction? I’m in Art Takes London. I’ll be at Berlin during June 2nd to 5th with our installation FocusPocus-videoparadox, so feel free to grab my sleeve and share thoughts! FocusPocus-videoparadox in Moscow Museum of Modern Art. in Moscow Museum of Modern Art. So if you are at the neighborhood, check it out! The results of the competition will be announced in late August. It’s the part of our installation, that revolves around the subjects of self-accusation, and some dynamics of social pressure.